Local government: how did it come about? Practically every week the A&T carries a report on some meeting or protest regarding our local councils and their deliberations. Whether you skip them or read them avidly probably depends mainly on your personal concerns or interests but regardless of your personal inclinations I think you will acknowledge the importance of such bodies. After all rubbish has to be collected, sports grounds maintained, streets lit, pot holes mended (we hope), social services organised, the list seems endless. Funding has to be organised and audited. And, periodically, you have the opportunity and responsibility to cast a vote for an individual who puts his or her name forward for election—often nowadays with a party label but less so in the past. I think it is worthwhile to reflect on this and consider how and why it came about, but where do we start? Way back in Anglo-Saxon times when England comprised several distinct and separate kingdoms each locality within those kingdoms had some kind of representative body that met regularly and oversaw that the laws, rules or regulations were observed so that everyday life could be managed relatively harmoniously. These meetings held at regular intervals, formally drew together some of the peasantry and representatives of the landlords, and in their deliberations decided on the conduct of everyday management and, in case of crime or misdemeanour, authorised punishments. I think this can be seen as an attempt to deal fairly with society and with those who broke its laws or ordinances mostly done imperfectly because there is no absolute and all-embracing solution. Whatever the particular arrangements they did set the pattern for local governance and individual participation and involvement. But even then society was remarkably complex. Administration was in the hands of the monarch, the church, and the land-holding lords and their sub-tenants. So courts, as they came to be called, had varied jurisdictions. For example, the lord of an estate would wish to see the land he occupied or owned managed as efficiently as possible both for his own profit through rents and also for the welfare of his tenants. How did this work? Basically, the meetings were called by a representative of the landholder, usually in this part of England called the steward, who appointed members of the peasantry to serve as responsible individuals to report on their areas of concern. Because at some early stage it was it was realised that the affairs of everyday life were really rather complicated the courts were subdivided, becoming courts baron, dealing with property transfers and related matters, courts leet and views of frankpledge dealing with everyday organisation and affairs through appointed officers rejoicing in such names as searchers and sealers of leather, haywardens, constables, aletasters and so forth and each was appointed or elected to serve for one year. These regular meetings were known collectively and generically as manorial courts. Unfortunately, relatively few of their records survive in the area covered by the A&T; elsewhere they survive in their thousands and are preserved in record offices. In or around the year 1200 the Lymington manor court was subject to a curious change when the settlement was divided into two parts, named Old and New Lymington. The latter, when created around the year 1200, was created a borough by the then lord of the manor William de Redvers and it was given its own borough court but that court was embraced within the manorial court of Old Lymington. The early records of its deliberations do not survive but can often be determined, at least in part, by related records dealing with other matters. However, from Stuart times there survives a consistent run of accounts showing how income is obtained and what it is spent on. 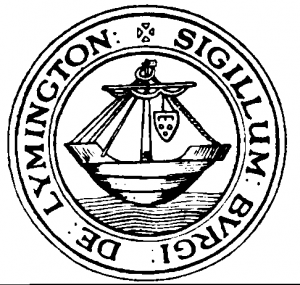 The Borough of Lymington was comprised of an indeterminate number of burgesses, usually numbering 50 or fewer, and a mayor who was elected from their number and a bailiff who was employed (rather like the later town clerk). Together these made up the corporation. The office of mayor had emerged from that of seneschal or prepositus who had what must often have been the unenviable task of representing the interests of the burgesses and dealing directly with the lord or his or her representative. One intriguing and practical aspect is to try to determine where the corporation should meet to conduct its business. The meetings of the burgesses and of the manor courts ultimately required a hall in which they could regularly gather to conduct their affairs. Possibly, at first, meetings were held in the house of one of the burgesses or even in the nave of the parish church, for we have no record of a town hall until 1299 when a building designated as such was described as being in need of repair, which suggests it may have been standing for some time. A later isolated reference I have found is in an inquest made on the death of the then lord of the manor, Hugh de Courtenay in 1377. It states, “The manor of Lymington has a house with a small curtilage which serves for holding courts including view of frankpledge.” Unfortunately, no location is mentioned. The earliest Town Hall for which we have any trace dates from 1463—the fourth year of King Edward IV—when a widow lady named Juliana Tevant residing at Lymington, presented to the town a messuage and site, whereon to build one. The grant stated: Juliana Tevant has given and granted to John Quicke, mayor of Lymington and his successors, and to all and singular the burgesses ‘a Messuage and Half-an-acre of Land adjoining thereto…having Le Highe Streete de Lymyngton on the north side, and a field belonging to the Priory of Christchurch on the south side…” Edward King in his history of Lymington identified its location as on the site of the present day 31 and 32 High Street (just a couple of properties east of the former Londesborough Hotel). Over the years this town hall became unsuitable and the corporation decided to erect a replacement that more fully met the more complex needs of Stuart legislation. From the year 1584 Queen Elizabeth had required Lymington to become a parliamentary borough returning two members, which meant that the political influence of the borough would be of greater importance especially as the franchise was vested in the hands of the mayor and burgesses only (and remained so until December 1832). The first town hall to be built in the street was erected in 1682-3. It was built by John Mitchell who was paid £143 13s. 4d. for its construction. This hall stood outside what are today numbers 92-3 High Street. This building comprised a single first floor room designed for borough meetings, supported on stone columns. The ground floor thus provided a sheltered market hall. Such structures were fairly standardised throughout the country and a great many still survive, even if modified, such as in Poole and in Wimborne. But within a few years the corporation found the building inadequate for their needs and transferred their meetings to the Nags Head (later the Londesborough) which they evidently found more congenial, especially as food and drink seemed be a crucial part of their deliberations. The old town hall building was then leased to the Fulford Grammar School until its demoliition in 1782. Lymington was then without a dedicated town hall until Paul Burrard, MP, of Walhampton decided to finance a new one. This was built in 1710 on a similar pattern to the earlier one except that the upper room (the corporation chamber) was supported on an arcade of open arches and was rather better furnished. This hall too stood in the High Street outside nos. 104-105. In the following year the town hall was packed to hear Sir Harry Neale and others give their views on the forthcoming Reform Bill that, on receiving royal assent, was fundamentally to affect the town and the whole nation. In 1835 the Municipal Corporations Act was passed and the government of the Borough was placed in the hands of directly elected councillors, aldermen and a mayor and the old burgess oligarchy after centuries of dominance was ended. It is informative to glance at some of the records in an attempt to unravel the operation of the corporation. The law of the land required that all boroughs and manors should keep proper accounts of their income and expenditure and for Lymington the accounts survive fairly completely from the early seventeenth century (reign of James I) and much can be learned of the management of the borough by examining them. The total expenses in the year ‘ending on the feast of St Michael the archangel’ 1614 are shown as £20 13s. 8d. Amongst the entries are included reimbursement to the mayor, John Pratt, of 50s., ‘repayrynge the key’ £4 18s. 6d., ‘2 planks for the fish shambles’ 2s. 6d. The total income for that year was £15, leaving a deficit which was carried over to the following year. Maintenance of the Quay was regarded as of prime importance and every year it formed an ongoing expense. But this was often defrayed by income from wharfage dues were payable on cargoes, both incoming and those shipped out. For example, in 1617 shipping ‘21 loads of wool of Thomas Turner’ brought in a payment of 17s. 6d. Dues payable by the traders at the two annual fairs brought in cash. The May Fair realised 17s. 3d. and the Michaelmas Fair 17s. 10d. In the year 1617 the corporation’s income was £11 12s. 4d. but we will never know what the expenditure was because that part of the page was long ago torn from the account book! At some stage the corporation was given Holmes Mead, a field now occupied by the present day Post Office, and the rent received from it was incorporated into the income. Money also came from renting stalls and shops owned by the corporation. All the income and expenditure accounts were carefully recorded annually. After the Civil War, during the Commonwealth (the 1650s), some of the manor court records survive and help supplement the information contained in those of the corporation and so help to provide a glimpse of life around four centuries ago. What strikes one is how very similar life was then to that of today, and how human behaviour in so many respects seems not to have changed at all. In 1650 seven beer retailers were fined 6d. each for selling beer without a licence and in stone pots. And a Richard King was fined 3s. 4d. for sending his leather for sale at Christchurch ‘unsearched and unsealed contrary to the statute.’ This entry reminds us that the manor courts operated within the law of the land and that each manor had to appoint a ‘searcher and sealer of leather’ to ensure the quality of what was on sale. But even the appointed officers of the courts didn’t always turn up to make their reports and in the same year (1650) the two constables and the aletaster did not appear to declare their accounts and in their absence each was fined 3d. Lym borough seal. This seal (as held by Samuel Samber, Mayor, in 1686) was used on official borough documents. It shows a merchant vessel with the arms of the Courteney family hanging from the yard. Lym Bushel measure. 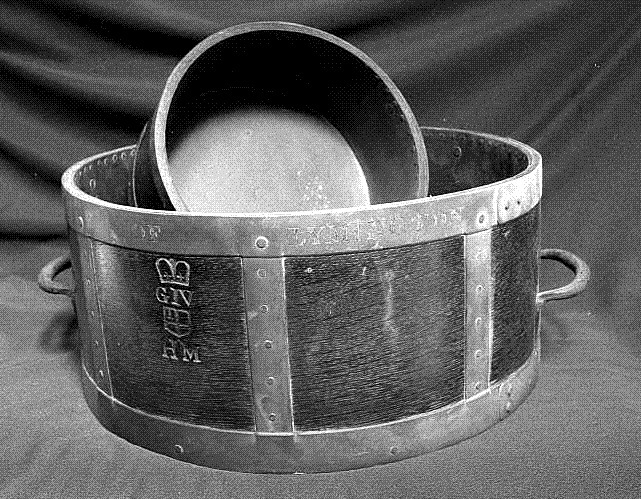 The official certified bushel measure, reign of George IV, used to guarantee uniform volume of grain (courtesy of St. Barbe Museum). Town Hall columns. 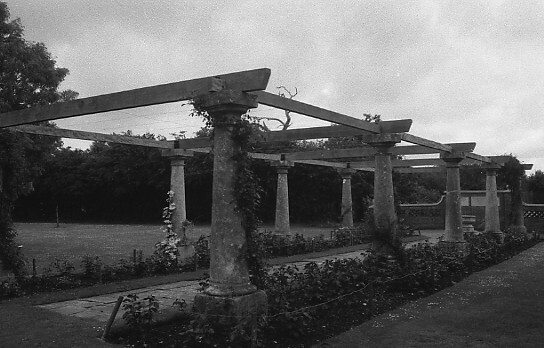 The stone columns from the 1686 town hall reset in Woodside Gardens. Town Hall 1710-1858. 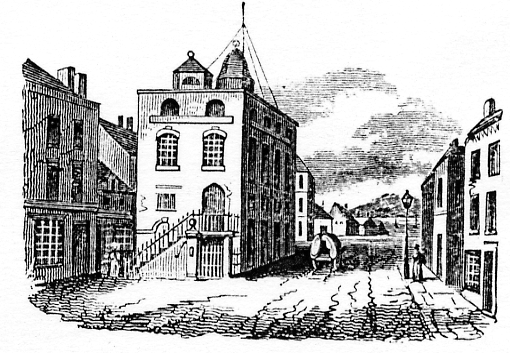 Drawing of the second town hall in the High Street by G.W. Bonner (1845), showing the external stone staircase to meeting room.